Odds are that nobody will be beaned by any remaining chunks of the nearly $750 million spacecraft, with NASA experts forecasting a remote 1-in-3,200 chance of a possible injury from the satellite's debris. That's where FEMA comes in. FEMA's "consequence planning" stems from lessons learned after the 2003 Columbia shuttle disaster over Texas, an incident that provided that agency with critical insight towards planning, preparing and responding. FEMA's on-call duties became moot when the errant NRO satellite was shattered by an interceptor missile on Feb. 21, 2008, rocketed spaceward from the USS Lake Erie, a U.S. Navy Aegis cruiser stationed west of Hawaii. 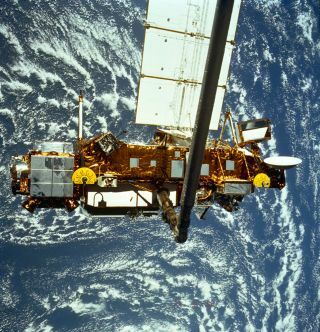 Contents of the spacecraft's propellant tank were dispersed high above the Earth by the shootdown. Since the spacecraft isn't carrying any hazardous materials, there's little need to try and shoot it down, officials said. "There doesn't appear to be a reason to do those same measures," confirmed U.S. Air Force Major Michael Duncan, deputy chief of space situational awareness for U.S. Strategic Command (USSTRATCOM) at Vandenberg Air Force Base in California. "Obviously FEMA is always prepared to assist … should any of these components land in the United States," said Nicholas Johnson, chief scientist for NASA's Orbital Debris Program at the Johnson Space Center in Houston. "It's, again, very, very unlikely when you look at the ratio of the land mass of the United States to the land mass of the world. We have had intergovernmental meetings on this issue and I feel very confident that they will rise to the occasion should the occasion arise." "And once you get 57 degrees plus or minus, you've pretty much encompassed all seven billion people of the planet," Johnson said. Zimmer has been in the prediction business for more than 45 years. He's also authorized by USSSTRATCOM to use their data and issue the results of his independent analysis as an open source. He predicts the end of UARS on Sept. 23, give or take 8 hours.